Relax and enjoy a full day of indulgence as we sample our way through the best of Normandy in one day : Honfleur and Giverny. 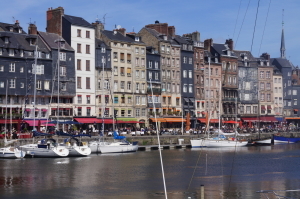 Honfleur is a quaint and picturesque fishing-port where the Seine river meets the English Channel. This estuary of the Seine has long fascinated artists, writers and painters including Claude Monet, Gustave Courbet and William Turner. Upon your arrival, your licensed, English speaking guide will give an introduction to the intriguing world of impressionism and the life of Claude Monet. This excursion will also take you down the backroads of ancient villages along the Seine in the footsteps of the impressionists. 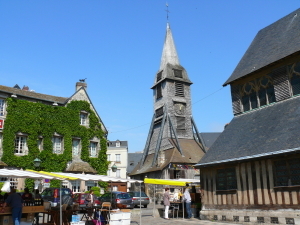 Your Guide will pick you up from your hotel or apartment in Paris, in a deluxe, private vehicle and, after a pleasant 2 hours drive along the river Seine, you will arrive in the charming town of Honfleur, small medieval town founded in the 17th century. The birthplace of the painter Eugène Boudin, Honfleur is recognised as one of the cradles of impressionism. With your guide, enjoy a private walking tour in the narrow paved streets , see the old dock surrounded by picturesque timber-framed houses, and the famous St Cathetine’s Church built entirely of wood with its famous bell tower. You will have time to relax and wander around the little streets, explore some art galleries, sample local produce, arts and crafts before having a gourmet lunch in one of the best bistros. After lunch, enjoy the scenery along the Seine on our way to the beautiful village of Giverny, situated at the gates of the Normandy region. 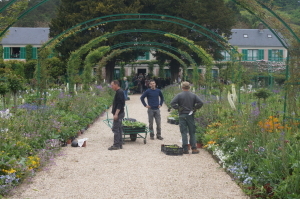 Then you will visit Claude Monet’s house and gardens! Follow your guide through a special entrance to bypass the long lines. He will give you the tickets already bought in advance for you. Claude Monet lived in his home at Giverny for forty-three years, from 1883 to 1926. In 1890 he became the owner of the house and gardens, and transformed them completely. Your guide will take yu first for a visit of the water garden with its famous Japanese bridge and water lily ponds covered with wisterias, before entering the flower garden in front of the house called the Clos Normand. This garden is incredibly beautiful, particularly between April and October (the vast range of flowers bloom successively, so that the garden changes gradually with the seasons whilst maintaining its colours and brightness). Enter the house and discover the first studio of Claude Monet, his bedroom, dining room, kitchen and his fabulous collection of Japanese engravings. 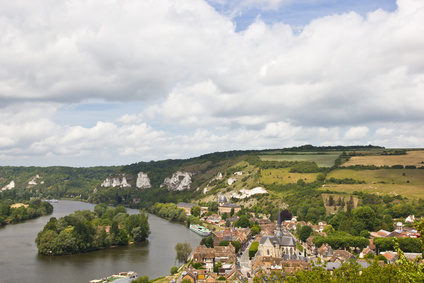 After a visit to the wonderful gift shop in Giverny , relax and enjoy the countryside scenery along the Seine Valley on your way to La Roche-Guyon and its castle, nominated as one of the most beautiful villages of France. Located on a bend in the Seine, the Château de la Roche-Guyon has a unique setting nestled against a steep cliff. It was also occupied by the German military during World War II (General Rommel’s headquarters). After one final stop for photographs , you will be returned to your hotel at the end of this rich and exciting day.